A light station was first established here in 1835. A concrete, crib type foundation was used to support a lighthouse constructed with a square tower and attached keeper's quarters and supply rooms. Built in 1936, the current lighthouse it is located at the end of the West pier. 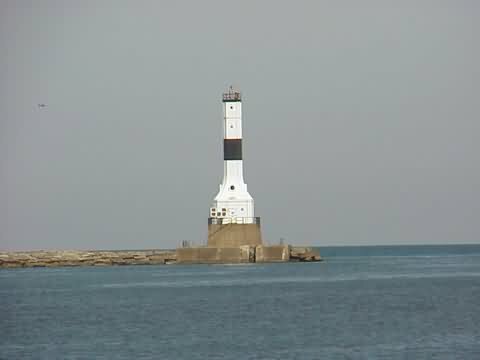 As a breakwater light, it is of a lighter but still strong type of construction. The white tower is of a "Art Moderne" style steel plate construction on a concrete foundation. It initially operated with the use of the original harbor light lantern and a diaphone type fog signal. Automated in 1972, the lantern room was removed and replaced with a 375 MM beacon. The light still operates as an active aid to navigation with the West Pier light exhibiting an alternating white and red beacon on 6 second intervals. It has a lens focal plane of 80 feet above lake level and a visibility range of 16 miles. It's day mark is white with a Black band. The West Pier light also has a fog signal producing a 2 second blast every 30 seconds. The end of the East breakwater also has a Pier light marking the entrance to the harbor. This smaller Pier light exhibits a green beacon on 4 second intervals at a lens focal plane of 46 feet above lake level and a visibility range of 7 miles. From I-90 take exit 241 onto Route 7 north. In 0.2 miles turn left onto Broad St.
Take Broad St. for 0.3 miles where it becomes Mariana Dr.
Take Mariana Dr. to the end. The lighthouse will be off in the distance.